The UCLA Fully Employed MBA at Anderson School of Management is a part-time program spanning between 27-33 months. It is designed for mid-career working professionals and provides three scheduling options during core courses, and even more schedules during electives. The program also gives student an option to take their core classes in a primarily online format (including only four weekend visits to UCLA’s campus per quarter) via the FEMBA Flex hybrid scheduling option. All classes for the program start during the fall semester. The UCLA Fully Employed MBA (FEMBA) 80 unit curriculum is spread over the course of 27-33 months, beginning with Leadership Foundation courses in the summer of the first year. This includes a one-week mandatory on-campus intensive unit. Students also complete a Career Management Workshop during this time. Students must attend classes on the UCLA Anderson campus four weekends per quarter, with classes on Saturdays from 2 to 8 p.m. and 8 a.m. to 3 p.m. on Sundays. The first year in the program students will complete 26-30 units worth of core courses, with 24-44 and 26-42 units spread over the second and third year, depending whether students opt to fast-track their program. The latter two years are comprised mostly of electives in the student’s individual specialties and the school’s six-month Global Access Program. Students in the program will work with international or U.S. companies establishing client relationships, identification of problems or strategic questions, design of study, collection and analysis of secondary and primary research data, development of comprehensive business plan, and formal presentation of findings and recommendations. The UCLA Fully Employed MBA Class of 2019 features 320 students. Around 26.8 percent of students identify as female and 73.2 percent of the students identify as male. The average GPA earned by students is 3.4 and the GMAT scores range from 620 -730. On average, students have seven years of professional experience when they begin the program. The average age of students enrolled in the Fully Employed MBA program is 30. Before graduating, nearly 83 percent of UCLA Anderson students receive a job offer and that number increases to over 91 percent three months after graduation. On average, Fully Employed MBAs receive a 23 percent salary increase after earning their degree. The annual tuition and fees for the FEMBA class of 2020 total $40,530. This includes student charges, parking, and other co-curricular costs. An additional admission deposit of $2,000 is also charged. Many private organizations offer scholarships and fellowships to graduate students in all fields. 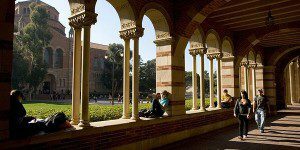 The UCLA Graduate Division offers an excellent resource for finding these external awards. The school’s database of external scholarships is called GRAPES (Graduate & Postdoctoral Extramural Support). Most student loans are based on either financial need or creditworthiness and are available only to US citizens and permanent residents. Anderson students commonly use the Federal Stafford Loan Program and Alternative Education Loans. Private loans may also be available. Applicants to the UCLA Anderson Fully Employed MBA program must have completed a Bachelor’s degree from a regionally accredited college or university and possess full-time, professional work experience not including internship experience for admission.